Avizor eye drops are produced by Wilens and provide effective relief for those who suffer from dry-eye syndrome or seasonal allergies. High-quality, hyaluronic acid-based Avizor eye drops by the Czech producer Wilens help keep your eyes moist for hours. A few drops per day are all that's necessary for long-lasting comfort throughout the day. 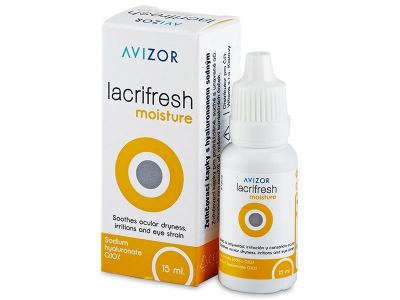 Avizor Lacrifresh Moisture eye drops provide effective relief from dry eye syndrome and other irritation caused by contact lenses and/or environmental factors like dust, pollen or air conditioning. Avizor Lacrifresh Moisture eye drops help improve the comfort of extended-wear contact lenses such as PureVision or Air Optix Night & Day.